CLR James on Marx, the Commune and their relevance for workers in the US. The American working class is not yet as familiar as the European working class with the history and traditions of the revolutionary socialist movement. March 14, anniversary of the death of Karl Marx, and March 18, anniversary of the Paris Commune will be celebrated by only a small minority. As the international crisis deepens, the American proletariat will rapidly increase its interest in the great thinker whose whole work was based upon the proletariat as the most progressive force in modern society and the irreconcilable enemy of capitalist barbarism. As the class struggle sharpens in the U.S. Marxism will come into its own as a great popular study. The American proletariat will then learn to celebrate in its own vigorous style the anniversary of those workers in Paris who in 1871, to use Marx's phrase, stormed the heavens. They gave to the world, for the first time, the "political form at last discovered under which to work out the economic emancipation of labor." Karl Marx's life was all of a piece. He devoted himself to a scientific demonstration of the inevitable decline of capitalist society. But side by side with this decline there emerged the socialist proletariat, the class destined to overthrow capitalism, establish the socialist society, and wipe away for good and all the exploitation of man by man. In Marx there was not the slightest trace of mysticism. He was a master of English political economy, German philosophy, and French political science. These he used in his monumental labors to establish that the social movement had the inevitability of a process of natural history, that it was "governed by laws not only independent of human will, consciousness, and intelligence, but rather on the contrary determining that will, consciousness., and intelligence." By this he did not mean to say that the future of human society was predestined in all its events and occurrences. He knew that men made their own history. He knew that social life proceeded by the conflict of interests and passions, complicated by all the bewildering phenomena which attend the daily activity of hundreds of millions of human beings. But he, more than any other thinker, established the fact that all these multitudinous actions took place according to certain laws. For him the most important law was the organic movement of the proletariat to overthrow bourgeois society. Perhaps today it would be as well to recall an aspect of his doctrine too often forgotten. No man had a more elevated conception of the destiny of the human race. This for him was the greatest crime of capitalism, that while, on the one hand, it created the possibility of a truly human existence for all mankind, by the very nature of the process of capitalist production, it degraded the individual worker to the level of being merely an appendage to a machine. In his great work, CAPITAL, over and over again, he pointed out that as capitalist production became more scientific, the actual labor of the worker was more and more deprived of intellectual content and educational potentiality. So far was Marx from being a vulgar materialist that in his denunciation of the evils of capitalist production, he did not hesitate (for the moment) to brush aside the wages of the worker. "In proportion as capital accumulates," he insisted, "the lot of the laborer, be his payment high or low, must grow worse." On the basis of economic analysis he drew the conclusion that modern society would perish if it did not replace the worker of today, condemned to automatic repetition of mechanical movement, by the highly developed individual. Such a man, according to Marx, would be fit for a variety of labors, ready to face any change of production, a man to whom the different social functions he performed were but so many means of giving free scope to his own natural and acquired powers. This for him would be a workers in a civilized society but that could come only by the destruction of capital. Such was his vision that this student of political economy and the labor process has unfolded perhaps the most poetic and far- seeing perspective for human society ever propounded by any philosopher or poet. According to him it was only with the creation of the socialist society that the real history of humanity would begin. Thus at a single stroke, he thrust into insignificance the painfully acquired knowledge and culture of thousands of years of civilization, which he, more than most other men, had studied and understood. All this, he said, would be as nothing in comparison with the perspective which would be opened to human society by the abolition of the exploitation of classes on the basis of a world-wide cooperation. Yet scientist and philosopher as he was, with the unquenchable faith in the inevitability of socialism, Marx was no mere man of the study. He took part in the German revolution of 1848, was active in the preparation of the revolution of that year, and to the end of his days participated, whenever possible, in the workers struggles against capitalism which he always knew as preparation for social revolution. In 1871, when the workers of Paris established the Commune, Marx hailed it as one of the greatest events in human history. Let us briefly recall the circumstances. France had been defeated by the armies of Germany which stood at Versailles, a few miles away from Paris. The leaders of French capitalism, statesmen, and soldier, were on their knees before the German conquerors, anxious to save their hides and the plunder that they had accumulated during the war. They were ready to sell out France to the conquered. The French people had proclaimed the French republic, and these capitalist politicians knew that one great obstacle stood in the way of their conspiracy with Bismarck. This obstacle was the armed republicans of Paris. Working in the closest association with the German invader, the French ruling class attempted to disarm the Parisians but the workers of Paris, emaciated by a five month's famine, did not hesitate for a single moment. They seized the power in Paris and established the Paris Commune. What exactly was this Commune? There have been many interpretations. The interpretation of Karl Marx remains unchallenged in its simplicity and its penetration. "It was essentially a working class government, the product of the producing against the appropriating class, the political form at last discovered under which to work out the economic emancipation of man." 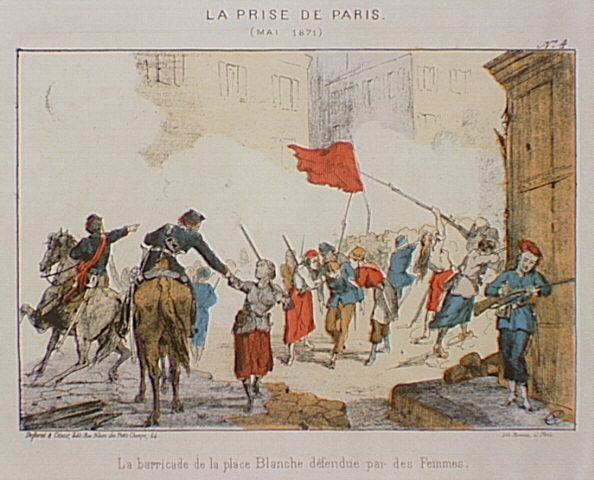 The Paris Commune was first and foremost a democracy. The government was a body elected by universal suffrage. None of its functionaries was paid more than the wages of a skilled worker. It did not expropriate the property of the bourgeoisie, but it handed to associations of workingmen all closed workshops and factories, whether the capitalist owners had run away or simply had decided to stop work. It lasted for 71 days. It was destroyed by a combination of its own weaknesses, chiefly a lack of decision, and the treacheries of the French bourgeoisie in shameless alliance with the German army. The murderous brutality with which the fighters of the Commune were shot, tortured, and deported, remained a landmark in European civilization, until the days of Hitler and Stalin. Today, to the American proletariat, there are many lessons to be drawn for the history of the Commune. Perhaps the most important for the advanced workers are the methods by which Marx approached its study and conclusions which he drew. For him, the Commune, despite its failure, was a symbol of inestimable value. It was a symbol in that it showed the real women of Paris -- heroic, noble, and devoted like the women of antiquity. It was a symbol in that it showed to the world: "working, thinking, fighting, bleeding Paris -- almost forgetful, in its incubation of a new society, of the cannibals at its gates -- radiant in the enthusiasm of its historical initiative." It was a symbol in that it admitted all foreigners to the honor of dying for the immortal cause. It was a symbol because even before peace had been signed with Germany, the Commune made a German working man the Minister of Labor. It was a symbol because under the eyes of the conquering Prussians on the one hand, and the Bonapartist army on the other, it pulled down the great Vendome column which stood as a monument to the martial glory of the first Napoleon. Marx saw in these actions not accidental gestures but organic responses of the revolutionary proletariat to the barbarous practices and ideology of bourgeois society. Most important, however, Marx drew a great theoretical conclusions from the experience of the Commune. He showed that the capitalist army, the capitalist state, the capitalist bureaucracy, cannot be seized by the revolutionary proletariat and used for its own purposes. It had to be smashed completely and a new state organized, based upon the organization of the working class. In 1871, he drew this as a theoretical conclusion. In 1905, and later in 1917, the Russian working class, by the formation of Soviets, or workers councils, laid the basis of a new type of social organization. It was by his studies of Marx's analysis of the Commune that Lenin able to recognize so quickly the significance of the Soviets and to establish them as the basis of the new workers' state. Today the advanced American worker needs to know the history of the international struggles of the proletariat. From these he will most quickly learn to understand his own. Marx's pamphlet on the Commune, THE CIVIL WAR IN FRANCE, is a profound and moving piece of writing. The worker who has not yet begun the study of Marxism will never forget this double anniversary if he celebrates it by reading what Karl Marx had to say about the great revolution of the Paris working-class.